This week I moved on up. Moved on up to the West Side. 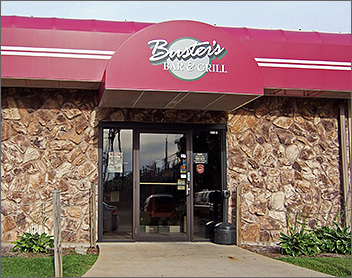 Buster's Bar & Grill to be even more exact. The outside of this place looks like any ordinary older bar, but don't be fooled. Inside looks new and has a little somethin' for everyone. Literally. Need to watch the big game? The massive TV's Buster's have might be of assistance. Maybe someplace to play some pool? How about darts? Or perhaps shuffle board will grab your attention. I know it certainly grabbed mine. I love shuffle board. I can thank my grandparents for that one. Back in the day, in Florida, that was the thing to do in their little community. But their generation played the old school way. You know, on pavement sliding disks with large hockey type sticks. Aside from the games you can play there, you can also get your drink and eat on. One side is lined with booths and there is a dining area that's kind of set away from the bar. Also there are huge bright octagonal windows to look out of. Another thing, it looked like you could cozy on up if you and your company weren't in the bar scene mood but wanted some drinks away from the drinking crowd. As for drinks on tap they carry Bud, Bud Light, Miller Lite, Lienies, what looked like a Cherry Wheat beer and Baumeister for all you soda lovers. In bottles they have the usual Bud, Miller, and Coors products plus a few more different brands. If beer isn't doing anything for you, you can always switch it to any mixer of liquid courage in the liquor form. They have a full liquor bar to prove it. Like I said, Buster's has a little somethin' for everyone. Buster's is here for you and your needs. Whether you need to people watch, play shuffle board, eat, drink, watch TV or just hang out.